If your headlight covers look hazy and naff, then try out these budget fixes that'll get them looking like new! Allowing your headlights to get cloudy not only reduces the amount of light that they let through, it also makes your car look nasty and will decrease its perceived value. So, if you don’t want to be that guy (because let’s face it, women know better than to let their rides slip like this), then get off your seat/gaming chair and do something about it. 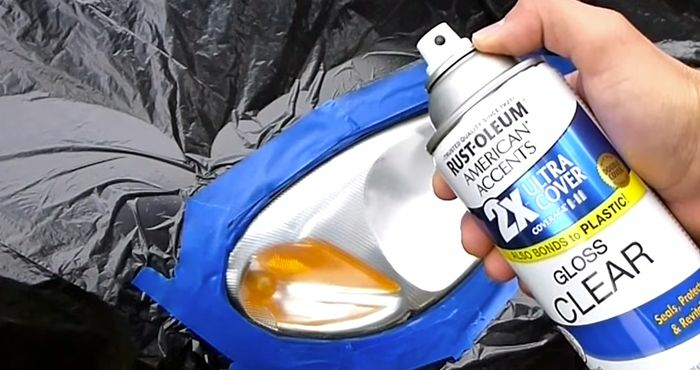 This is one you’re probably already familiar with, and for good reason: it’s one of the cheapest ways to restore headlights. All you need is toothpaste with baking soda (the gritty kind of toothpaste), which you squeeze into your hand and rub into the oxidised and hazy lights (you can also do this with an old toothbrush or a Dremel). The harder you rub, the better, and after a while you should start to see the toothpaste turning a dirty colour (see this How-To video by ChrisFix). Once the toothpaste has dried on your headlights, simply wipe off with a cloth and warm water, and hey presto, your lights will be looking a whole lot clearer. Finally, give the lights a layer of wax and a good buff to make sure they don’t get yellow again too quickly. This toothbrush trick isn’t a permanent solution (usually lasting anywhere between a few weeks and a couple of months), but it’s quick and cheap and is a great trick before a car show or inspection. The things you need here are a couple of cloths and two jugs, with distilled white vinegar in one and baking soda in the other. First off, pour the vinegar into the baking soda. This causes the solution to fizz up because of the differences in PH (baking soda is alkaline, while vinegar is very acidic). Mix the paste together and rub the headlights with it using a cloth. 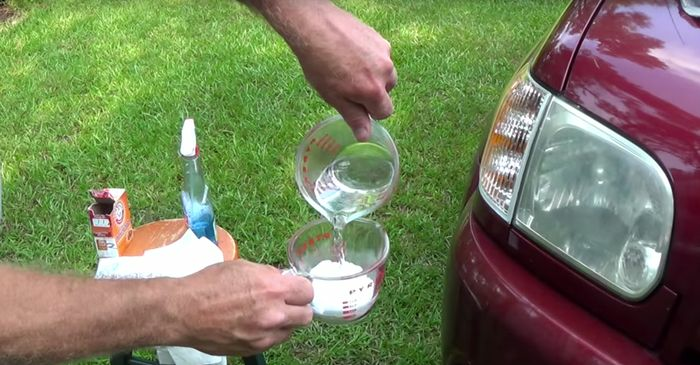 Much like the toothpaste trick, the baking soda used in this fix acts as a rubbing compound to get rid of the oxidisation on the headlights, while the vinegar cuts through the grime (see How-To video). Once you’ve rubbed the headlights thoroughly, take a clean cloth and wipe the baking soda/distilled white vinegar mix off. Again, give the headlight a layer of wax and a good buff to help protect it. 3. Doing the job properly! Ideally, you’ll want to remove the headlights from your car, which is usually a matter of undoing a few screws and disconnecting the light bulbs. 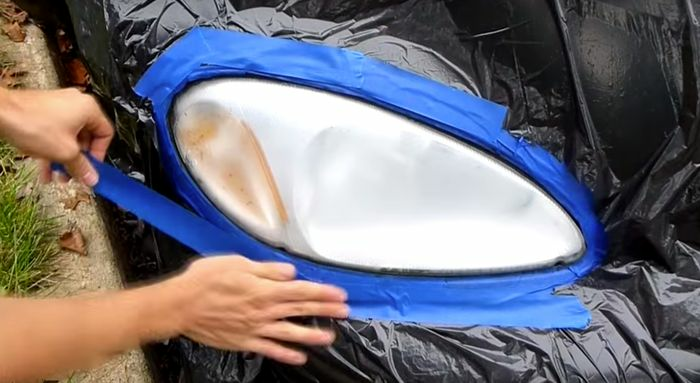 If the car in question makes this task too much of a chore (like the PT Cruiser in this How-To video), then simply tape around the headlight to make sure that you don’t scratch the car’s paint during the sanding process. Before you begin sanding, it’s important to know the meaning behind the different grits of sandpaper. Very simply put, the higher the grit number (measured per square inch of sandpaper), the softer the sandpaper will be on the surface you are rubbing it on because there are more sharp edges in the aforementioned square inch of sandpaper. If you have very coarse wood that you wanted to sand smooth, for example, you’d need to start with a very low grit number (30 perhaps) before gradually working your way up to a polished wood finish (500-grit sandpaper). For headlights that are heavily oxidised and very cloudy, it’s good to start with 400-grit sandpaper (classed as super fine sandpaper). If your headlights aren’t too cloudy, then you can use 600-grit sandpaper instead. Before sanding, apply water (which acts as a lubricant) to the headlight and the sand paper. Lightly sand the headlights in a circular motion and make sure to keep spraying the surface with water throughout the process. Once you’ve done this, sand horizontally on the headlight using the same sandpaper (either 400 or 600 depending on oxidisation); the horizontal motion means that your clear coat is less likely to run on application later. If you’ve been using 400-grit sandpaper, then repeat the above process (light circular sanding motion followed by horizontal sanding) with 600-grit. Clean off the headlights with water and a paper towel to get rid of any plastic that you’ve sanded off. Now you need ultra-fine 2000-grit sandpaper, which you’ll apply lightly with water in a swirling and horizontal motion. This smoothes the surface even more, making it ready to be cleaned and UV-coated. 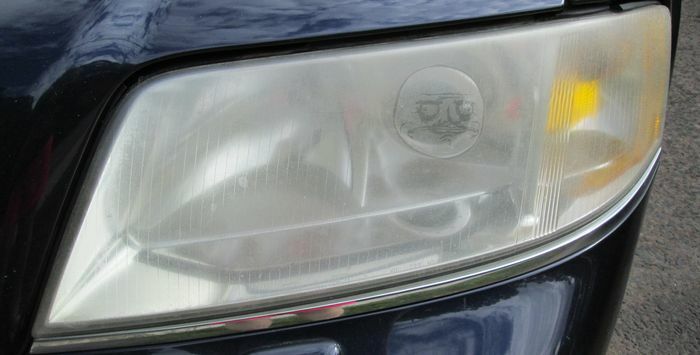 Now that you’ve wet-sanded the headlights, you need to clean them with rubbing alcohol and a paper towel. This removes any oils that may have been transferred onto them from your hands. Before you apply your clear coat spray, you need to mask off your bumper, wings and bonnet with a garbage/rubbish bag. To do this, open up the bag, cover the headlight with it and tape it onto the body panels. Then, roughly cut out a hole for your headlight and tape around it as per image. Because you’ll be applying multiple coats, make sure each step of application is done lightly and evenly. Between coats, allow the clear coat to dry (five minutes is enough) before applying a second and third coat. 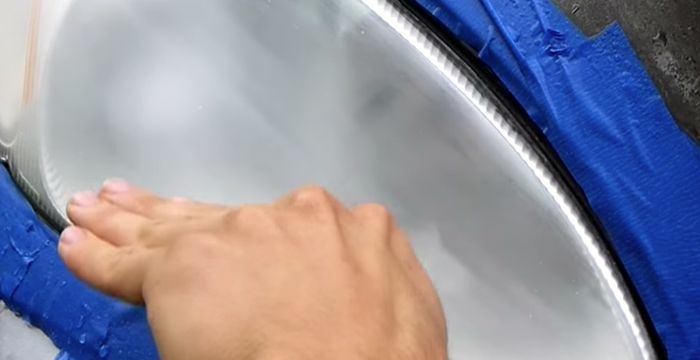 Leave the headlights for 24 hours to make sure they dry properly, after which you’ll see how clear they’ve become (see this How-To video by ChrisFix). Then, it’s only a matter of removing the tape and rubbish bag to see your car’s full and permanent transformation!